One Bourbon is NOW OPEN! 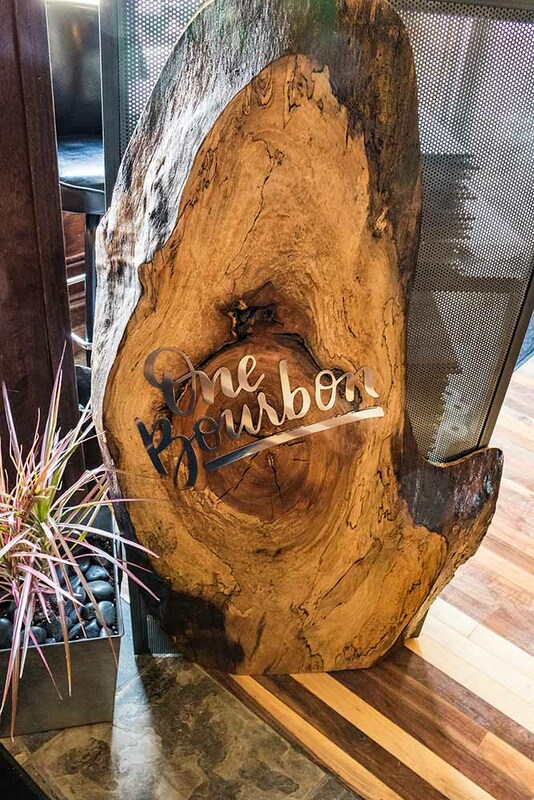 Our friends at One Bourbon opened their doors to the Grand Rapids community this past March. We were lucky enough to provide their new space with some custom signage and a custom hostess stand. Each piece was created to tie their sophisticated style in with their appreciation for rustic accents. 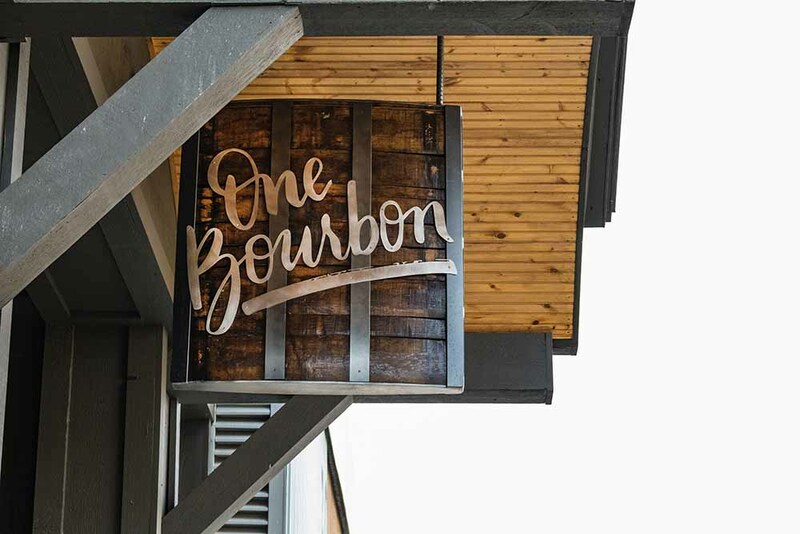 From the stainless steel wall art in their dining room, to the custom exterior bourbon barrel sign that hangs in front of the building, we had a blast designing and working with the awesome people of this new establishment. One Bourbon is located at 608 Bridge NW, Grand Rapids, MI 49504 CLICK HERE to learn more about One Bourbon. We build a custom steel hostess stand that sits just inside the entrance to One Bourbon. The steel stand has shelving in the rear allowing ample storage for menus and other items. The front of the stand features a maple live-edge slab in the shape of Michigan’s lower peninsula. This one of a kind slab was sanded and sealed to reveal the beautiful wood grain. To finish it off we attached a polished stainless steel “One Bourbon” logo to the front. This completed the stand with some fresh branding to accent the rustic features of the wood slab. The vast dining room had a large space between the two kitchen doors. When speaking with the owner of One Bourbon, we began to think about options to fill this space. We decided to do an unpolished stainless steel wall art piece. Using the “One Bourbon” logo, we decided to go with a laser cut version of the logo. The piece fit perfectly between the two kitchen doors, and has become the focal point for the dining room. On opening day, the area in front of this sign was used by patrons to get a photo at their new favorite establishment while promoting the One Bourbon name. 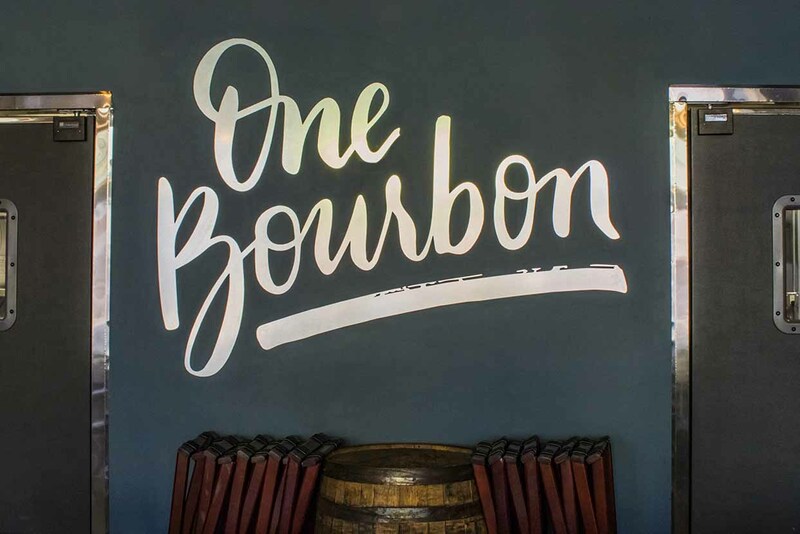 When creating the exterior bourbon barrel sign for One Bourbon, we knew we needed to stay true to the bourbon roots. We decided to construct a sign made with items from an old bourbon barrel. 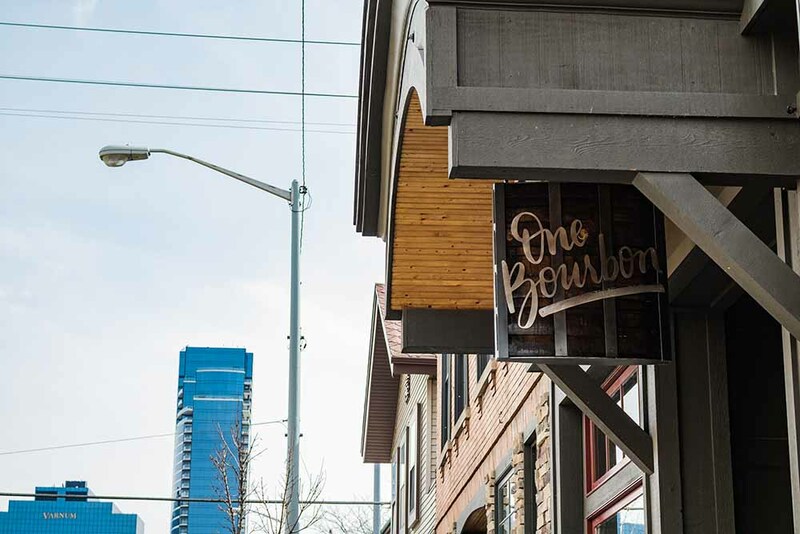 The sign, which hangs under an arched overhang along Bridge Street, brings the “bourbon” feeling outside. The sign mirrors the style and vibe found within One Bourbon’s facility. We used a stainless steel “One Bourbon” logo on either side. The stainless steel works to accentuate the dark brown color of the sealed wood. We were proud to have worked on this project and are very excited for One Bourbon and their future in Grand Rapids. If you’re a bourbon lover, or a fried chicken lover, One Bourbon is the place for you!